2019 Sen. Jay Rockefeller Lecturer, Rep. John Lewis. Support the Center for Medicare Advocacy! Join us for our 6th annual National Voices of Medicare Summit and Senator Jay Rockefeller Lecture. This year’s program will connect leading experts and advocates to discuss access to health care as a human right, the challenges and successes of Medicare, and where we can go moving forward. 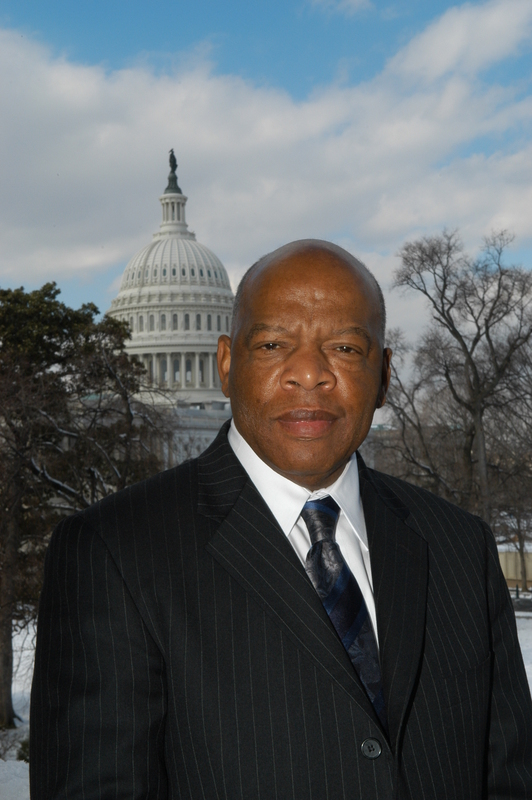 Rep. Lewis will then be joined by Sen. Rockefeller and others for a panel discussion. Join Us For This Historic Program! Sponsorship and advertising opportunities are also available via the registration page or by contacting Scott Perkins, Development Director, at sperkins@medicareadvocacy.org or (202) 293-5760. As in prior years, the Center has reserved a block of rooms at the Washington Marriott at Metro Center, just a few minutes walk from the venue. These rooms will only be held through April 18, 2019, so reserve yours now at https://aws.passkey.com/e/49829939. Recently, the Center for Medicare Advocacy laid out our Medicare Platform for the New Congress. One of the core considerations to improve Medicare for all beneficiaries, now and in the future, is the need to preserve and expand consumer protections and quality coverage for all Medicare Beneficiaries – including parity between traditional Medicare and private Medicare Advantage (MA) plans. We previously wrote about limited access to Medigap policies, oral health care, lack of an out-of-pocket cap on beneficiary expenses in traditional Medicare, and the need for comprehensive long-term services and supports (LTSS, also known as long term care). Last week, we discussed the ongoing payment imbalance between traditional Medicare and MA. Another critical parity issue between traditional Medicare and MA plans is the manner in which Medicare options are presented to the public by the agency charged with running the Medicare program, the Centers for Medicare & Medicaid Services. As the Center has documented elsewhere, since Fall of 2017 CMS’ outreach and enrollment materials have encouraged beneficiaries to choose a private Medicare plan over traditional Medicare, instead of objectively presenting enrollment options. Rather than presenting differences between traditional Medicare and MA in a neutral, unbiased manner, CMS is overplaying the pluses of MA and downplaying any minuses in a manner that is highly misleading, at best. Our concerns include certain revisions to Medicare & You, online comparison tools, and education and outreach materials, including an enrollment period email campaign that downplayed or entirely left out the option of traditional Medicare altogether. CMS leadership has repeatedly denied that they are favoring private plans or steering Medicare beneficiaries towards enrolling in such plans, however actual experience and recently released materials from CMS suggest otherwise. CMS engaged in a “General Medicare Open Enrollment Email Outreach” campaign that went to approximately 7 million unique email subscribers nationwide. It consisted of 12 general Open Enrollment email bulletins that included messaging focused on deadline reminders and promoting eMedicare tools to compare plans and estimate costs. (Slide 11) While the Center’s analysis of this material showed that it downplayed or left out the option of traditional Medicare altogether, and could be interpreted by recipients to imply that they had no choice but to enroll in or stay in a private plan, CMS has engaged in even more blatant favoring of the MA program. “With Medicare Advantage, you can choose the coverage that’s right for you. Pick from a variety of plans to get the benefits that matter to you. Get more benefits for your money. Medicare Advantage plans include extra benefits like hearing, vision, and dental coverage. By changing the tenor of its general outreach materials, and particularly with its targeted MA campaign, CMS is abdicating its duty to provide objective, balanced information about Medicare coverage options. Instead of continuing to tip the scales in favor of the Medicare Advantage program, we urge policymakers to advance complete equity between MA and traditional Medicare, including both the scope of services provided, programmatic spending, and CMS education and outreach. Congress should oversee CMS’ activities regarding Medicare Advantage to ensure the information it provides is complete and accurate, and to ensure all Medicare beneficiaries are treated equally. The Office of Medicare Hearings and Appeals (OMHA) is the agency that administers the Administrative Law Judge (ALJ) hearing program for Medicare Parts A, B, C and D appeals. OMHA has a Case Processing Manual that sets out day-to-day procedures for carrying out adjudicative functions, in accordance with applicable statutes, regulations, and OMHA directives. Importantly for many, it gives the staff at OMHA direction for processing ALJ appeal requests. Most recently, on February 1, 2019, OMHA released the revised Chapter 9 that addresses “Request and Correspondence Intake, Docketing, and Assignment.” (See: https://www.hhs.gov/sites/default/files/request-and-correspondence-intake-docketing-and-assignment-02-01-2019.pdf). The Case Processing Manual can help answer questions not otherwise found in applicable statutes, regulations or Centers for Medicare & Medicaid Services (CMS) Policy Manuals. For example, we recently had an inquiry from a beneficiary asking how to consolidate two separate appeals that dealt with two different services from two different providers, but with both services related to the same condition. Other than requesting aggregation to meet the amount in controversy requirement, which was not the issue in this case, we found no answer in the regulations or CMS Policy Manual. However the Case Processing Manual, provided some answers. Chapter 9, section 9.3.6.2 discusses how to group appeals and appears to provide some guidance when an appellant requests that cases be consolidated prior to ALJ assignment. The Case Processing Manual chapters also addresses, among other things, issues such as the role of representatives in the appeals process, case prioritization, the administrative record, and the scheduling and noticing for pre-hearing conferences and hearings. The Case Processing Manual is an excellent resource. New and revised chapters can be accessed at https://www.hhs.gov/about/agencies/omha/the-appeals-process/case-processing-manual/index.html. Chapters that were published before May 10, 2018, can be accessed at: https://www.hhs.gov/about/agencies/omha/the-appeals-process/case-processing-manual/2017/index.html. In cooperation with states, the Centers for Medicare & Medicaid Services (CMS) regularly identifies a subset of nursing facilities, generally one to two facilities per state, that are among the most poorly performing facilities in the country. These nursing facilities, which CMS calls Special Focus Facilities (SFFs), have “more problems” than other facilities, “more serious problems” than other facilities, and “A pattern of serious problems that has persisted over a long period of time” (i.e., the prior three years). CMS requires states to conduct surveys at SFFs twice as often as at other facilities and to impose more stringent enforcement actions “the longer the problems persist.” Within 18-24 months of a facility’s designation as an SFF, CMS generally expects that the facility will either: improve and graduate; or be terminated from participating in the Medicare and Medicaid programs. Each month, CMS identifies five categories of SFFs: newly-designated SFFs, SFFs that have not improved, SFFs that have improved, SFFs that have graduated, and SFFs that are no longer participating in the federal payment programs. As demonstrated below, CMS has not followed through on these requirements for SFFs. CMS is not imposing serious enforcement actions against SFFs that it cites with actual harm or immediate jeopardy deficiencies, or both. To the contrary, CMS is not imposing any sanctions at all or is imposing only small financial penalties, averaging less than $20,000, against SFFs that it finds have not improved. On February 5-7, 2019, the Center looked at CMS’s most recent list (dated January 19, 2019) of 37 SFFs that CMS identified as not having improved. CMS had originally designated these facilities as SFFs between 5 and 30 months earlier. The Center looked at the federal website, Nursing Home Compare, to determine whether CMS imposed civil money penalties (CMPs) or denials of payment for new admissions (DPNAs), or both, against them. 28 of the 37 SFFs were cited with actual harm or immediate jeopardy deficiencies in 2018. 14 of the 28 SFFs that were cited with harm or jeopardy deficiencies, or both, in 2018 did not have CMPs or DPNAs imposed for deficiencies cited in 2018 (although CMPs had been imposed for deficiencies cited in earlier surveys). Only 14 of the 28 SFFs that were cited with actual harm or jeopardy deficiencies, or both, in 2018 had either CMPs or DPNAs, or both, imposed against them. Only 9 of the 28 SFFs that had not improved had CMPs imposed for actual harm or immediate jeopardy deficiencies that were cited in 2018. Only 1 CMP exceeded $100,000. The remaining 8 CMPs ranged from $10,400 to $53,089 and averaged $19,616.50. In all instances, the CMPs were considerably lower in 2018 than the CMPs imposed against these facilities in 2016 and 2017. 3 of the 9 SFFs with CMPs also had DPNAs imposed against them. 5 of the 28 SFFs had only DPNAs imposed against them. In 2016 or 2017, or both, these 5 SFFs had CMPs imposed against them. 9 of the 37 SFFs were not cited with harm or jeopardy deficiencies in 2018. 2 of these 9 SFFs had CMPs imposed. The Center concludes that the Special Focus Facility Program is failing to achieve its goals of focusing additional attention and enforcement resources on nursing facilities with a history and record of extremely poor care. CMS is not imposing significant penalties against SFFs that have not improved, even when it cites them with actual harm and immediate jeopardy deficiencies. The extraordinarily limited enforcement against even the most poorly performing nursing facilities in the country underscores how weak enforcement has become. CMS must change course and impose meaningful financial penalties against facilities that fail to provide residents with the care they need. CMS, “Special Focus Facility (“SFF”) Initiative,” https://www.cms.gov/Medicare/Provider-Enrollment-and-Certification/CertificationandComplianc/Downloads/SFFList.pdf.